The sun was beaming down on the cobblestones of the upper courtyard of Dublin Castle. On the big stage at one end of the yard, our female Justice Minister, sporting an appropriately bright pink jacket, was chatting to Ireland’s most famous drag queen and gay rights activist, Rory O’Neill, aka Panti Bliss who was in full regalia for the day that was in it. A short while earlier, Panti had posed for a selfie with clearly star-struck Sinn Fein President Gerry Adams. At the courtyard entrance Heath Minister Leo Varadkar, a gay man, had just arrived to a massive cheer. With the stroke of one million, two hundred and two thousand, one hundred and ninety-eight pencils, all changed, changed utterly: a magical beauty was in the Irish air. It was as if someone had swapped the camera filter through which we have all viewed life in Ireland for the last number of years. It was just like that point in the ‘Wizard of Oz’ when suddenly the dull sepia tones of an arid Kansas landscape switch to the dazzling rainbow colours of the land of the yellow brick road. It was a referendum count like no other. At 9.00am in the RDS count centre, the boxes opened to unleash a tsunami of ballot-papers which flowed over the lines of trestle-tables. By 9.08am, Labour TD and Counting Day soothsayer Kevin Humphreys, after checking the tallies from one of his weathervane boxes from Ringsend, predicted “It’s over. It’s a strong Yes”. But it still took time for everyone to realise just how resounding that Yes would be. Tiernan Brady from the Gay and Lesbian Equality Network was glued to his phone, alternately doing radio interviews with the likes of NPR (a US network) and scanning tallies from around the country. “Some gay in the villages of Emly or Bansha will wake up tomorrow feeling better about life,” he said, surveying tallies from Tipperary. There was wonderment that Donegal, our electoral contrarians, might say Yes. “Does that make Bundoran the new Sitges?” wisecracked one observer, in reference to one of the favourite holiday destinations of the gay community. Humour abounded around the count centre. “Have the pink cages descended around our children yet?”asked one campaigner, tongue firmly in cheek. But emotions spilled over too. Former Fianna Fail minister Pat Carey who came out this year cried as he spoke to the media. And many campaigners reached for tissues when they were given an impromptu thank-you speech by Yes Equality directors Grainne Healy and Brian Sheehan. “We said we wanted to have a conversation with people on the doorsteps, and by doing that you brought the core of our lives and the reality of our stories into kitchens around the country,” declared Grainne as many dissolved in tears. And those conversations had proved to be an incredibly effective tactic, tapping into the psyche of a people who were - as usual - way ahead of the bubble-worlds of the Catholic church and Leinster House. Hannah Maloney was at the count with her parents Michael and Caroline Gavin and her brother Leo. She had flown in from New York to vote, as a surprise for Leo who is gay. “I’m so glad I did - you feel you’re part of making history happen,” she said. It was this decent and kind response by the Yes voters which made this a referendum like no other. The hardest of hearts were melted and the most adamantine minds changed during this campaign by big interventions and small moments: Ursula Halligan’s fearless baring of her soul in print; a video of a young woman singing ‘She Moved Through the Fair’ as the ferry bringing her and other scattered Irish citizens home to vote, docks in Dublin; a photo of 101-year old Kitty Cotter from Bandon going out to vote, all decked out in her rainbow best. So many prejudices were sent flying: all old people will vote No. All of rural Ireland will vote No. Working class areas will vote No. Eamon Gilmore, the man who put marriage equality firmly on the political agenda, was quietly happy. “It’s an act of inclusion by Ireland, a day of liberation for gay people,” he said. By early afternoon, the streets around Dublin Castle were thronged with gay couples holding hands and walking tall in the sunshine. Inside the gates, 2,000 people - gay and straight, mammies, daddies, children, babies, couples - milled about in a state of joyful expectation, garlanded with rainbow flags. It was a smart move by junior minister Simon Harris to open the Castle to the citizenry - the day was about inclusion, after all. Brian O’Driscoll and Amy Huberman and their two children were among the crowd, as was Irish actor Andrew Scott who played Moriarty in the TV series ‘Sherlock’. Mingling unrecognised in the melee, he said, “It sends out such a great message that Ireland is an accepting country; the solidarity between gay and straight is wonderful”. On the giant screen, one by one the 43 constituencies flashed Green to the sound of cheers. 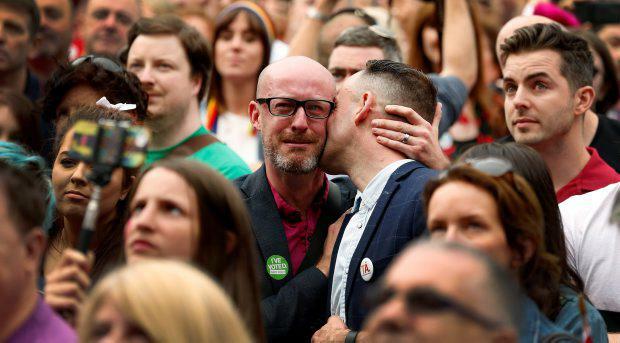 There was noisy acclaim for Panti, and for stalwart of the gay rights war, Senator David Norris, and for Leo who upon arrival enfolded Fine Gael’s Director of Elections Simon Coveney in a fierce hug. Sinn Fein’s TD for Donegal North-East Padraig MacLochlainn was nervously watching the big screen. Finally both constituencies lit up in emerald. Padraig threw his arms in the air, and wiped away a tear. “I had the Donegal fear. I feel like we’ve won the All-Ireland. Sam Maguire should be here,” he proclaimed. Padraig even got a congratulatory hug from Labour’s equality minister Aodhan O’Riordain - another minor miracle in a day of wonders. There was a robust boo when Roscommon-South Leitrim flashed up the solo red like a bullseye on the big map. But it served as a reality check that over 730,000 people voted No. There had been graceful concession statements from some on the No side, such as David Quinn of the Iona Institute and Archbishop Diarmuid Martin. Some others, not so much. After a long wait for the final results from three Cork constituencies, at 7pm it was made official, sparking an outpouring of cheers, tears, happiness and a moving, impromptu rendition of ‘Amhran na bhFiann’, a nation wearing its multi-coloured heart on its sleeve in front of the world’s TV cameras. And the world was tuning in. The most perfect response came from German newspaper Bild which simply Tweeted: “Irland 12 Points” - thereby dispelling yet another cherished Irish prejudice that all Germans are a little short on the humour front. Afterwards, the Taoiseach and Tanaiste gave a press conference behind the Castle, once the seat of British power but now the backdrop to people power. “Would a majority of people, in this our Republic, stand with them and stand up for them so that they can live in our shelter and no longer in our shadow? Today they have their answer,” Enda declared. Much later, at around 3am in her bar on Capel Street, Panti had reached her own conclusions. Standing on the stage, she addressed a packed, exuberant, exhilarated crowd. “You are all f***ing legends,” she pronounced. Incredibly, as the sound of Yes filled the air during the long day, a rainbow arched over the capital. And for that technicolour moment we were Oz, shaking off monochrome years of austerity and inequality, of unfairness, exclusion and fear. We were transformed into the place where troubles melt like lemondrops. And for the first time in a long time, we could proudly proclaim, there’s no place like home. Millennials have arrived. What new tyranny is this? Jody Corcoran An interesting finding in the yearly vital statistics published by the Central Statistics Office last week is that in the decade to 2017 there has been a 12pc decrease in the number of registered births. Jody Corcoran So, you think you know what happened in the abortion referendum? Well think again. Jason Kennedy "Hello. I'm campaigning for a Yes vote in the upcoming marriage equality referendum. Do you have a moment to have a chat?"